I spent a couple of hours in the woods with a fellow Hoodlum. I will call him TC per his request. 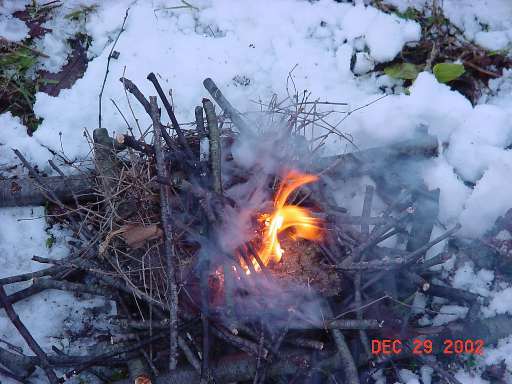 We would practice making fire by friction - not a trivial task in the winter! 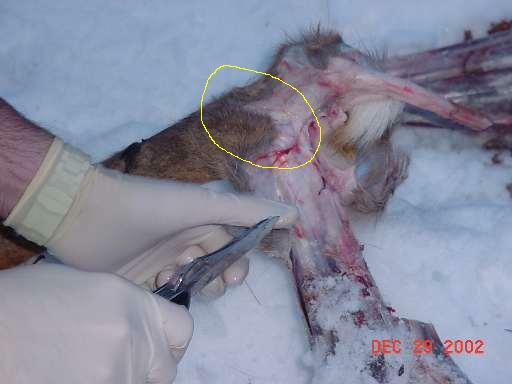 We were anxious to try using the astragalus bone from a deer as the bearing for the drill. Fire by friction is a cool skill to "own", but not very practical when you are in a hurry. 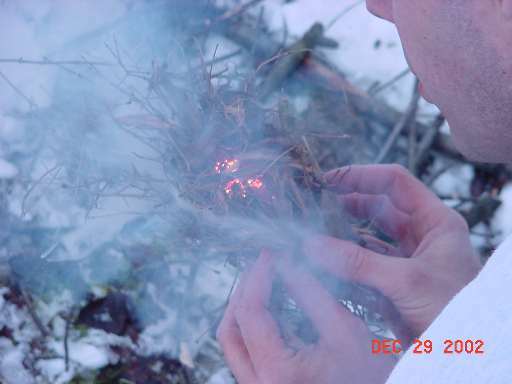 Firebuilding takes careful preparation under most conditions, but especially when you are making fire by friction. 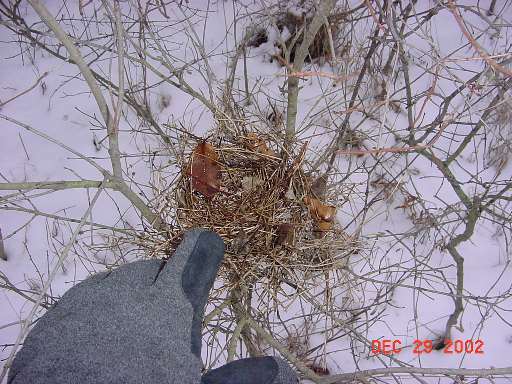 This birds nest will form the basis for a tinder nest. 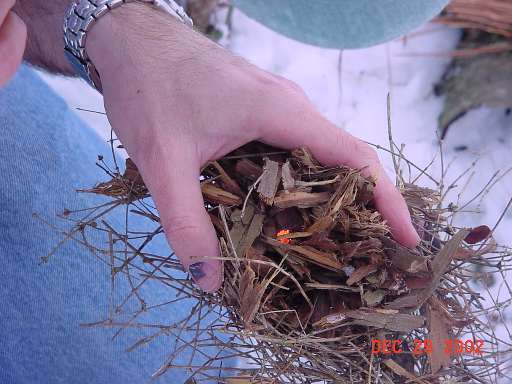 I also gathered cedar bark and placed finely shredded pieces of bark inside the nest. TC begins to work with the assembled set. The drill and fireboard were scrap cedar purchased at Menards. The bow was gathered on the spot. The string is inexpensive nylon paracord which has been doubled over and twisted into rope to minimize stretch and maximize grip. A closeup of the drill. It's working! 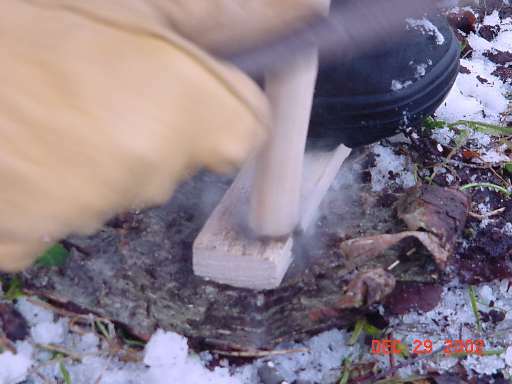 The notch cut into the side of the fireboard provides a place for the dust from the drill and fireboard to gather and create a coal. Once you see a black (not brown) coal that smokes on its own, you're there! 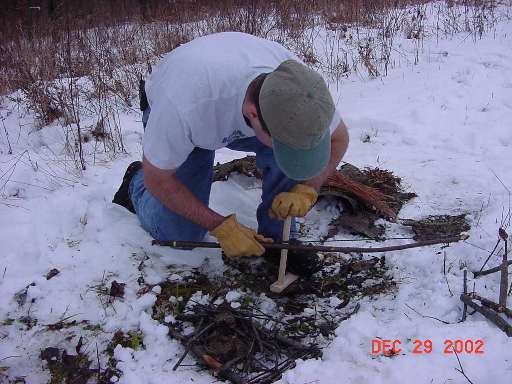 Don't forget to place a piece of bark or leather under the notch so you have some means of moving the coal to the tinder nest. The coal has been moved to the aforementioned tinder nest. At this point, you can take your time. Blow gently and the coal will start to glow. Gently close the nest around coal so the coal is in contact with the tinder. 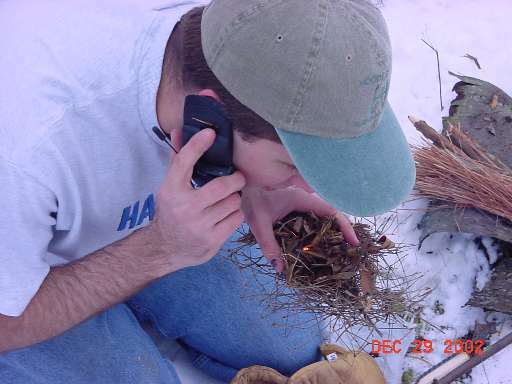 Two worlds collide...while TC was in the process of starting fire using this primitive method, he gets a call from his wife on his cell phone! Lots of smoke always precedes the fire. I've done this many times but it is still a thrill for reasons which I cannot explain! The most difficult component of the bow drill set to find in the outdoors is the socket (hand piece). You need something which you can comfortably hold in your palm, with a smooth round hole to hold the drill and allow it to turn with minimal friction. 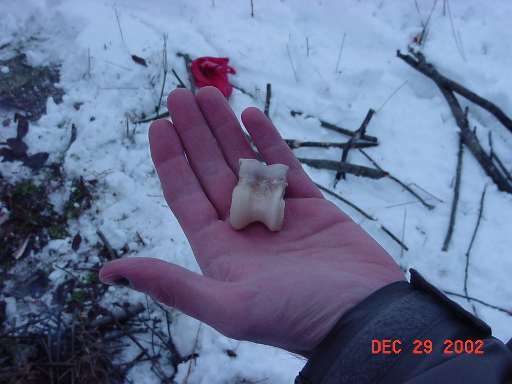 In this case, we used the astragalus bone from a deer. TC took this bone from a deer he recently harvested. He boiled the bone for about an hour to remove all traces of meat and muscle. As luck would have it, someone had dragged a road kill into the parking lot. They had removed the hide and left the carcass. This gave TC a chance to show where the astragalus bone is located. The astragalus bone is located on the rear leg where the tibia meets the tarsels. 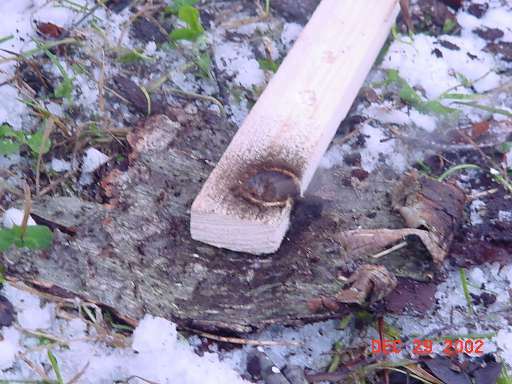 Discussion of the notch on the fire board: In survival literature, one usually sees the notch on the fire board described as a "V" cut into the side of the board, with the vertex at the center of the shallow hole into which the drill is seated. I told TC that I had learned long ago (I think it was in the written instructions which accompanied the BSA Fire by friction set) that the notch should be what I call an inverted V; that is, imagine an upside down V, with the vertex at the top of the fireboard cut straight back to the center of the hole. This inverted V provides a cone shape hole for the dust from the drill to fall into. This cone shape hole does a better job of containing the dust in one place so that an ember can build. 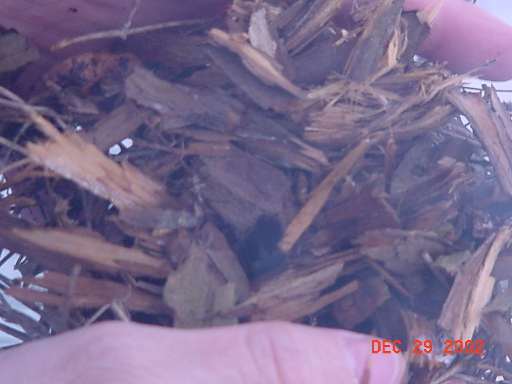 When the V is cut in the other method indicated above, the dust tends to just fall out, making it more difficult to concentrate the heat in one place so as to form the ember. This was the first time TC had tried the notch in this manner, and he agreed that it works much better. He built another fire later with the same materials but the other notch, and he said it took much longer. I am including this comment here at his suggestion. Copyright © 2002 by Bill Qualls. Last updated December 31, 2002. Back to Bill's survival page.